A New Tracie Peterson Series! I have been a fan of Tracie Peterson’s books since—Well, for as long as I can remember! Her first novels were published by Barbour’s Heartsong line in the 1990s. Each title was short (about 170 pages) and centered around a budding romance between a man and a woman who grow in faith by the story’s end. In those days I was a Heartsong subscriber, so Tracie’s books automatically arrived my doorstep. She quickly became one of my favorite authors. I’ve been a constant reader of her stories ever since; in fact, six of her novels figure prominently on my keeper shelf. Fast forward twenty years later, and I’m still an avid reader of Tracie’s books. Her latest series is “Brookstone Brides,” about a traveling Wild West show comprised of all-female performers. I love the premise! The first book in the series, When You are Near, released earlier this month, and automatically appeared on my Kindle (we’ve come a long way since the 90s!). You can click on the cover to read the book description. When You are Near had everything I’ve come to expect from a Tracie Peterson book: strong characters, a complex story, surprise twists, and an historical setting so well written you think you’re living the time period. 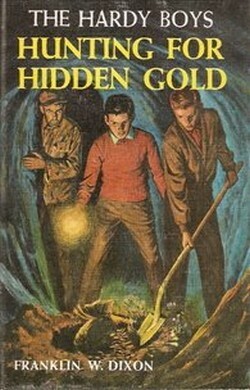 As soon as I finished reading it, I wanted more, and began searching for information about the next book in the series. The good news is, I don’t have long to wait long to read it. Wherever You Go (Book 2) comes out in June. It’s already available for pre-order on Amazon. Here’s a link, if you’d like to read the book description. I just found out that Book 3 in the series, What Comes My Way, will release in October. You can click on the cover to read the description. By the way, aren’t the covers beautiful? They really capture all the little details that help make the time period come to life. If you love reading about strong, determined women, the old west, and vulnerable hearts learning to trust God and His Will, then Tracie’s new series just might be for you! I hope you’ll check it out. In the early 1980s singers Willie Nelson and Julio Iglesias recorded “To All the Girls I’ve Loved Before,” a song that paid homage to the many, many women they loved and lost (or dumped) over the courses of their lives. I’ll say straight up, I’m not a fan of the song; but for some reason, it’s been stuck in my head for the last 48 hours. So I decided, if I can’t get the song out of my mind, I might as well repurpose it in a way that makes sense to me. So, I’m taking a page from Willie and Julio’s book, and presenting to you a list all the book heart-throbs I once loved. 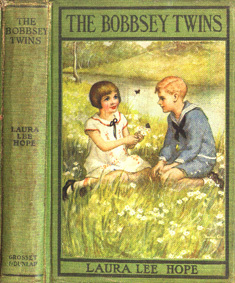 My First Love was Bert Bobbsey, oldest of the two sets of twins in the Bobbsey family household. Now that I think back on it, Bert was really more of an admired older brother than a crush, but I thoroughly hero-worshipped him until I found . . .
My second crush, Frank Hardy. Level-headed, smart, and brave, he was the hero of more than one thrilling book adventure in my grade-school years. Plus, he was handsome and a sharp dresser. I’ve loved pull-over sweaters on men ever since. Laurie from Little Women. Theodore “Laurie” Laurence set the standard for me when it came to the man I thought I’d like to fall in love with. 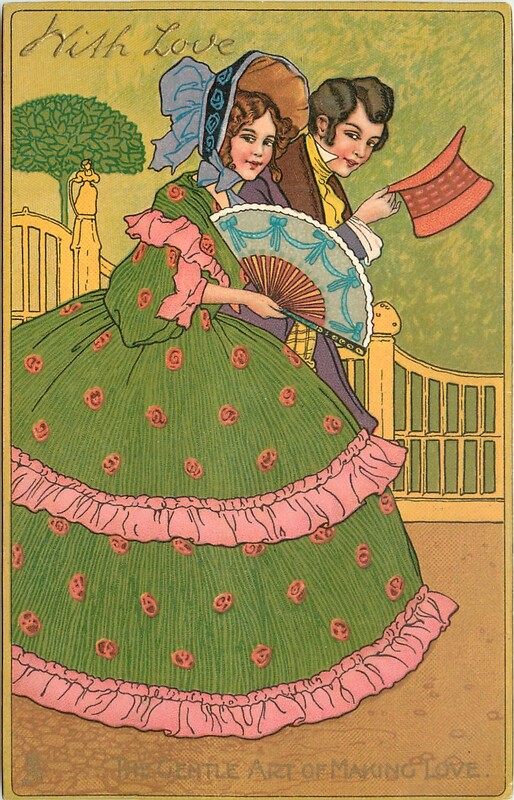 Laurie and Amy March in an illustration from my 1939 edition of Little Women. He was smart, rich, playful, good at keeping secrets, and heart-throbbingly loyal. I was a little troubled to see how quickly he transferred his affections from Jo to Amy, but since everyone in the book ended up happy (with the sad exception of Beth, of course), I was willing to overlook Laurie’s change of allegiance. 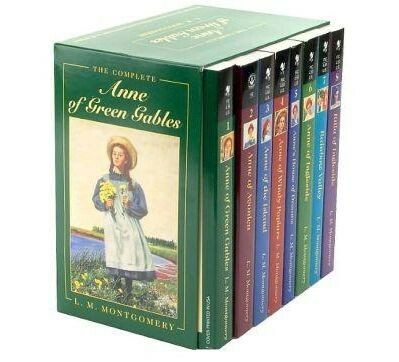 I have the full collection of Anne of Green Gables books, as well as the beautifully filmed mini-series by Sullivan Productions (I never get tired of watching it!). One reason I love the series so much is Gilbert Blythe. Gilbert was introduced in the book as a . . . Tall boy with curly brown hair, roguish hazel eyes and a mouth twisted into a teasing smile. 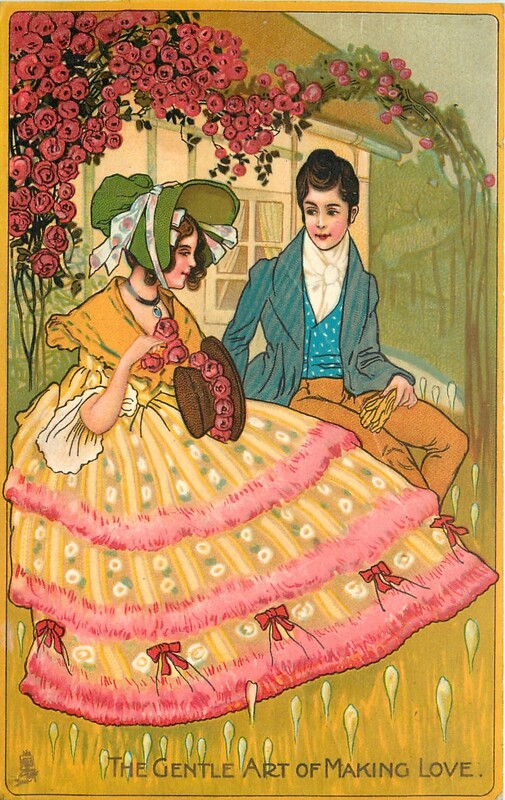 From the moment he first set eyes on Anne, and he winked at her, you knew he liked her. He really liked her. Anne wanted to speak but she could find no words. Happiness was breaking over her like a wave. It almost frightened her. 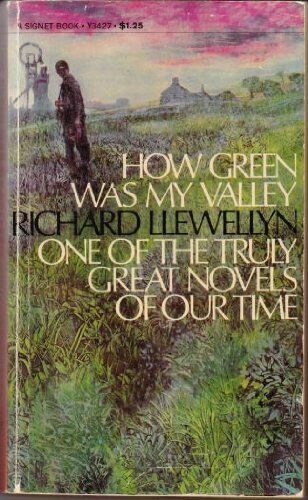 Richard Llewellyn’s 1939 novel How Green was My Valley chronicled the life of Huw Morgan as he grew to manhood in a Welsh mining town. It’s been my all-time favorite novel since I first read it when I was 12. There are many memorable scenes in the book, but for me, some of the most poignant and beautifully written moments are between Huw’s older sister Angharad (pronounced an-HAR-ad) and the Reverend Mr. Gruffydd (pronounced Griffith). It’s clear that Angharad is in love with him, but does he love her in return? I loved Mr. Gruffydd for trying so hard to do the right thing by the woman he loved, yet getting it so wrong. Those weren’t all my book boyfriends, but they were the ones that made impressions on me at a young age. As I grew older, I fell in love with Gabriel Oak (Far from the Madding Crowd), Sidney Carton (A Tale of Two Cities), and Fitzwilliam Darcy (Pride and Prejudice). But Bert, Frank, Laurie, Gilbert and Mr. Gryffydd have a very special place in my heart. How about you? Did you ever have a crush on a fictional character? I’d love to know who! And they’re easy to scan and share. Just about any topic you can think of has been memorialized on a postcard at some point in time, from old recipes to historic landmarks to fashion styles. 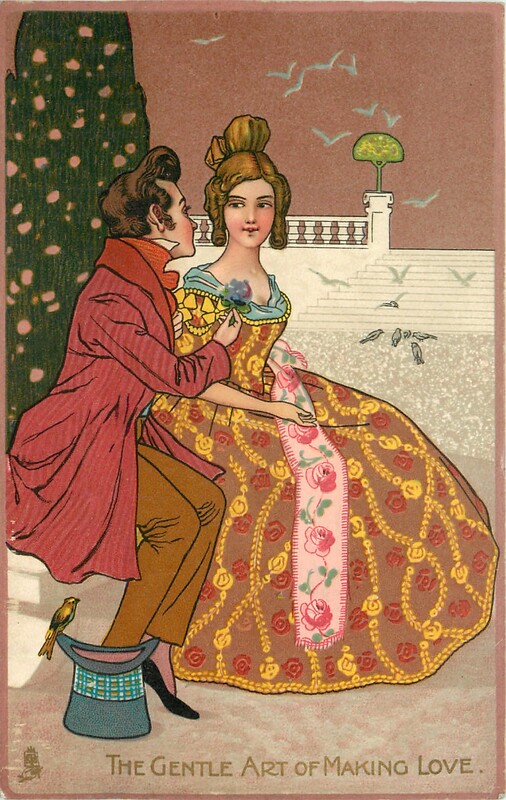 A couple years ago I came across a set of postcards titled “The Gentle Art of Love Making.” Each card in the set illustrates a phase in the courtship process; judging from the clothing depicted, the cards were meant to represent courtship during the late 1860s to 1870s. 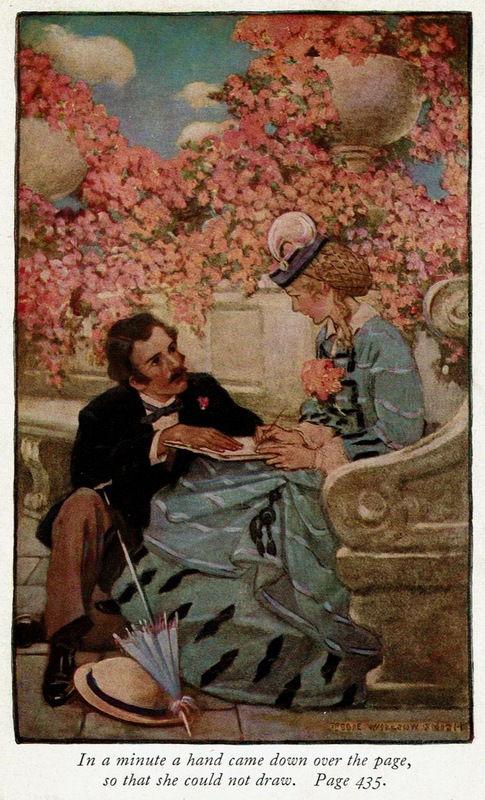 Phase 2: He gives her a flower. In a very Disney touch, a little bird witnesses the gesture. 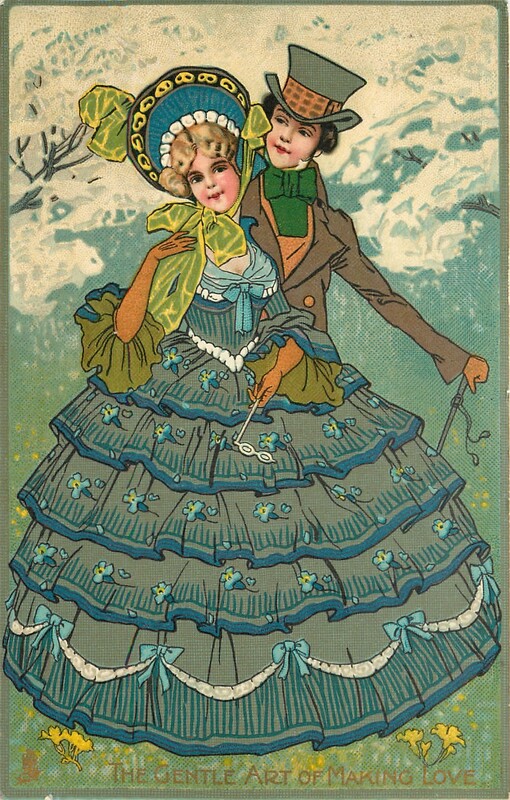 Phase 3: She takes the liberty of trimming his hat with roses—a very romantic gesture, don’t you think? Next, the couple dances together. And— Voila! — they’re a couple! Just like real life, right? Actually, the cards are more true to life than they might initially appear. When Prince Charming and I first met, we sort of followed the same sequence of events; but instead of going for walks, we went for drives in his beat-up old Volvo. And instead of dancing, we sat together in church. We learned to study God’s Word together and make decisions based on prayer and the lessons Christ taught us. Another similarity: he gave me flowers. Nothing extravagant, because we couldn’t afford it, but his bouquet of dyed carnations meant more to me than a dozen long-stemmed roses, because I knew they were given in love. 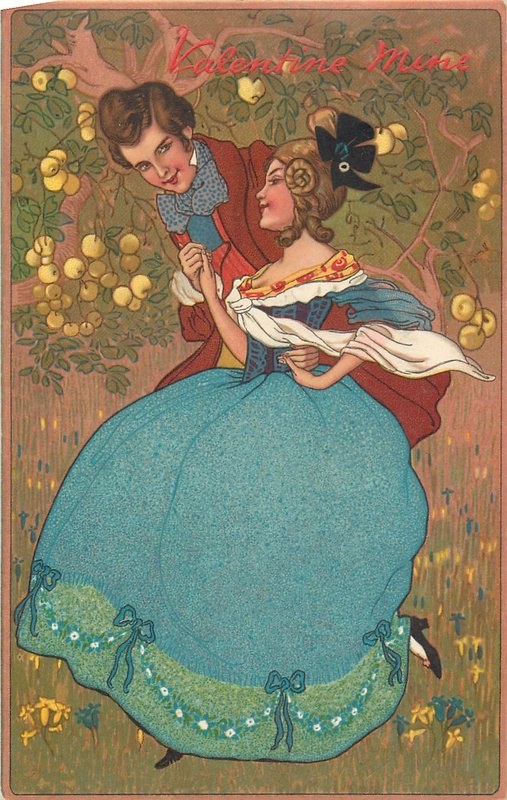 So after I thought about these postcards in that context, I realized they really were a nice representation of the phases of courtship and the “gentle art” of falling in love. 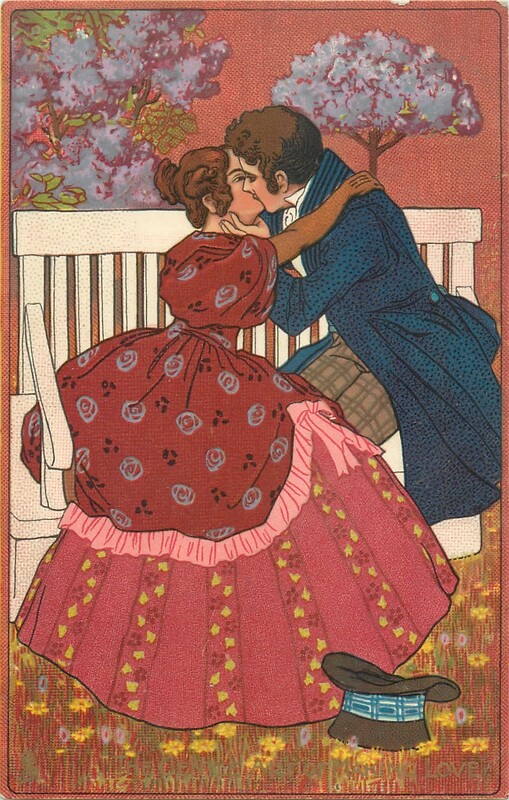 I’d love to know what you think: Do these postcards capture the phases of falling in love? 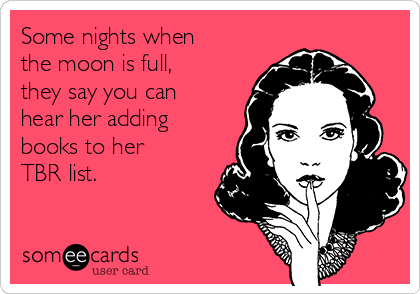 Does your own experience with romance follow the pattern set here? Silly me, I thought I was making significant progress in getting my To-Be-Read mountain whittled down to size of a decent hill. You see, I went on a reading binge in December, which I carried over into January. 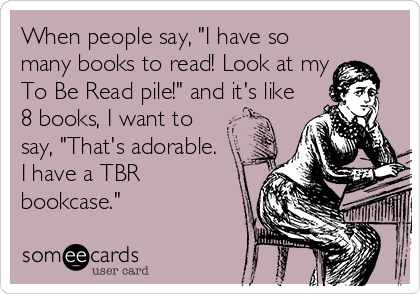 I knocked a couple dozen books off the top of my TBR pile, and was feeling pretty smug about, too. But then it happened. On Friday I got an e-mail from American Christian Fiction Writers with a list of 24 new releases from their member authors. Member authors whose books I love. Hallee Bridgeman, Kara Isaac, Michelle Griep. Need I say more? Of course, these are must-have books. Sandra Ardoin is a new author to me, but I couldn’t resist pre-ordering her novella. We’re talking mail-order bride, Alaska gold-rush, and a hero with emotional baggage, which means it, too, qualifies as a must-have book. Some of the books on the ACFW list haven’t released yet, and that’s good news! Good because I have some time to make further headway on reducing my TBR before I start adding to it again. Have you seen the ACFW’s new release list? (You can view it here) I’d love to know what books caught your eye. When you think of Colorado, what words come to mind? For me, horror in Colorado means I forgot to put my gloves on before going outside in below-freezing weather. For a lot of other people, though, horror in Colorado means The Shining. 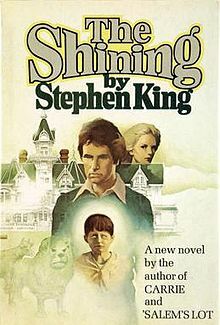 The Shining is a 1977 novel by Stephen King. Director Stanley Kubrick made it into an over-the-top movie starring Jack Nicholson and Shelley Duval. It hit theaters in 1980. 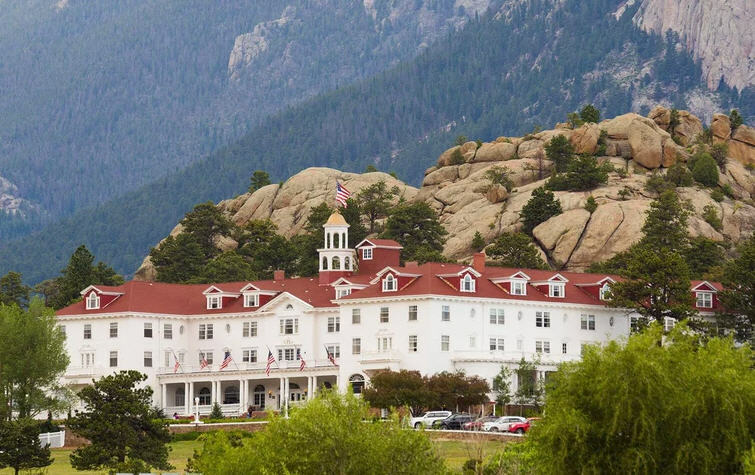 Coloradans have a bit of a love affair with the book and the movie, because our own Stanley Hotel served as the inspiration for Stephen King when he wrote the novel. The Stanley is a beautiful hotel nestled against the foothills of Estes Park, Colorado. The Stanley Hotel in Estes Park, Colorado. Guests and visitors are encouraged to wander about the hotel, take in its history and ambiance, and explore the grounds (which you can do on your own or with a guided tour). You can even wander through the hotel’s hedge maze (installed in tribute to a scene from the film). And since Estes Park is one of my favorite places on Earth, as well as the most beautiful (in my humble opinion), I kind of click with The Stanley’s connection to all things Stephen King. Last month production closed on a new movie called “Doctor Sleep.” This movie is also based on a Stephen King book by the same name, published in 2013. And guess what? 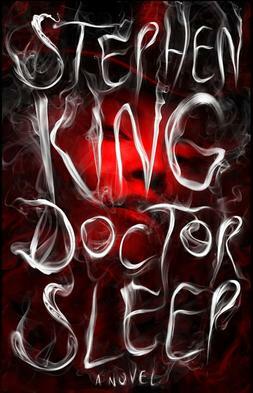 King wrote Doctor Sleep as a sequel to The Shining. 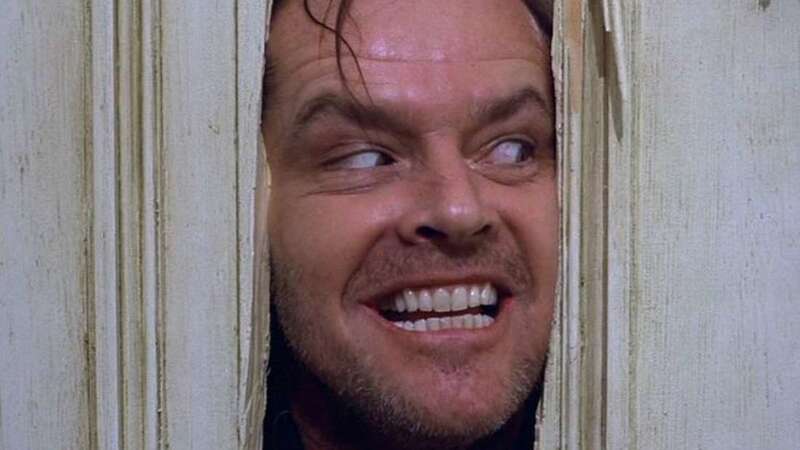 In the past I’ve enjoyed watching the movie adaptation of The Shining. The film is more campy and fun than scary and horrifying. But the new movie adaptation of Doctor Sleep is going to be an entirely different animal. The director expects the movie will earn an “R” rating; and since the story involves vampires, I anticipate there will be plenty of graphic scenes involving blood and body parts. Not my cup of tea. But then, I’m a wimp about those kinds of things. If you’re a Stephen King fan and want to learn more about the movie adaptation of Doctor Sleep, here’s a link. What about you? Do you like horror movies? How graphic do you like your movies to be? I truly wish I had more time to read all the wonderfully instructive and entertaining blogs that are available on the Internet. I subscribe to about a dozen blogs because I know from experience their content never disappoints. And thought I don’t subscribe, I also read several other blogs each day from my favorites list. Given all the blogs I read, there’s one that consistently stands out as the one and only, hands-down, “Must Read” blog that I never miss. Her posts are short in length but long on message. No matter the topic she writes about, she always touches my heart with truth and conviction. Her posts are entertaining. I love the little insights she gives about the rodeo way of life. She’s a natural and gifted story-teller, who effortlessly weaves stories from her own life experiences into a mini-lesson that ties nicely with a Bible truth. Some of her posts have meant so much to me that I’ve gone back to read them over and over again in the ensuring days and weeks. Davalynn Spencer’s blog is the one blog I truly look forward to reading every week, and I doubt that’s going to change anytime soon. If you haven’t yet read her blog, I hope you’ll give it a try and let me know your thoughts about it. And if you have a favorite, can’t-miss blog, please share it! Christmas is now less than a week away and I’m happily in the full spirit of Christmas. Like many, many (many!) people, Christmas is my favorite time of the year. My house is decorated, the weather has taken on a nice nip of cold air, and I just finished the last of my holiday shopping. I’ve deposited toys, cash, and canned goods in the appropriate donation bins and red kettles around town. My Christmas tree is glowing with ornaments and lights, my gifts to others are wrapped and arranged under said tree, and my crèche is lovingly positioned in a place of honor in the living room. Everything’s in order for Christmas day. There’s just one more task left . . . and it’s one of my family’s favorite traditions. In the last days before Christmas, we gather every evening to make popcorn, arrange bowls of chips and dips, brew tea, and pour hot cocoa, all in preparation for watching our favorite Christmas movies together as a family. And not just any Christmas movies. In my house, it’s all about tradition, and there’s an order to it all. Oh, yes, Die Hard is a Christmas movie, a gift for the guys in your family. It has plenty of alpha-male shoot-em-up action, a healthy dose of humor, and a few ho-ho-ho’s. An added bonus: it puts my guys in the right mood to handle the sentimentality of the remaining movies we’ll be watching. Now we’re heading down the more traditional Christmas movie track. Meet Me in St. Louis stars Judy Garland as a young woman growing up at the turn of the 20th Century. It’s a beautiful movie, from sets to costumes to characters, and the singing . . . well, I did use the magic words, “Judy Garland.” I tear up every year watching her sing “Have Yourself a Merry Little Christmas” to her little sister, played by Margaret O’Brien. I’ve read this beloved book many times since I first read it as a child. From the opening line—“Christmas won’t be Christmas without any presents”—the story chronicles the lives and loves of the four March sisters, and their devotion to each other through hardship and joy. This year we’re watching the 1949 version starring June Allyson as Jo March, which is one of my favorites. The other version I love is the 1994 movie starring Winona Ryder in the same role. We’ll watch that version next year (we alternate each year between the two) and I’ll have a big box of Kleenex by my side. This 1942 holiday classic used to run on television every year on Christmas Eve. My entire family sat down to watch it because it was just so much fun. It was my first introduction at a young age to the magic of a Fred Astaire’s dancing . The firecracker scene is one of his best and most entertaining dance sequences ever. Let’s be clear: I’m not talking about some fancy-shmancy color version. I’m talking about the classic, black-and-white version of Miracle on 34th Street that originally hit theaters in 1947. This movie doesn’t need to be updated or colorized; it’s perfect just as it is. My recommendation: don’t watch this movie on television with commercial breaks; they cut too much of the movie out to fit the broadcast time slot. Find a digitized, black-and-white version on DVD, pop it in your player, sit back with a cup of hot cocoa, and enjoy this story about believing in the magic of Christmas and the hopefulness of the human spirit. For me White Christmas is the best of the best Christmas movies, so it’s no wonder our family gives it the place of honor: a viewing on Christmas night. Since its release in 1954, four generations of my family have viewed and enjoyed this fun, inspiring, and charming movie. After a busy day of attending church services, opening presents, and visiting friends and family, it’s nice to gather in the evening, wearing the new jammies Santa brought, and cuddling under the comfy new throws we received as gifts, to watch White Christmas. Every year we look forward to seeing the “Sisters” routine—we know it by heart, of course, but we laugh each year as if we were seeing it for the first time. I’m sure this year will be no exception. So there you have it. Now you know how my family and I will be spending the remaining evenings leading up to Christmas. What about you? Do you have Christmas traditions you and your family enjoy in the days leading up to Christmas? Leave a comment below to share!